Amitabh Bachchan and Jaya Bachchan were present a fashion show as their daughter Shweta Bachchan walked the ramp. An inside video from the event is now going viral. Actor Amitabh Bachchan and Jaya Bachchan recently attended the star-studded fashion show of Abu Jani & Sandeep Khosla for cancer patients. Walking the ramp for the designer duo were Shweta Bachchan, Karan Johar and Sonam Kapoor. 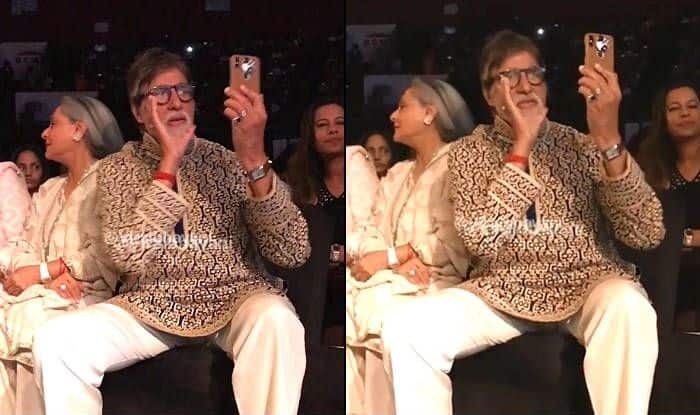 In a new video from the show that’s currently going viral on social media, Big B is seen filming his daughter Shweta on the phone as she walks the runway. But, the catch is not that. The interesting part is Senior Bachchan whistling to get the attention of a videographer who’s blocking his vision. Amitabh Bachchan is known to be a doting father to Shweta. Even his son Abhishek Bachchan has revealed how Big B always stays biased towards Shweta. This video is just another proof of the same. Only a daughter can turn her father, who’s by the way known as the ‘angry young man of Bollywood’, into a cute dad. Another highlight of the show was Sonam Kapoor grooving to Alia Bhatt’s Ghar More Pardesiya song from Kalank. Wearing a stunning creation by the designers, the actress started twirling on the ramp and showed some classical dance moves. She was then joined by Karan and Shweta who finished the show. During her appearance on Koffee With Karan recently, Shweta shared many details about her bonding with the family and her views on being a part of the film industry. Shweta also expressed how she’s completely daddy’s daughter and her father also loves her the most. Abhishek agreed that Shweta is most precious to their father and that the legendary actor always makes sure to never ignore what his dear daughter has said.